Lit by Earth’s continental combustion, not sun. Science note- moon lit by fire is not scientifically correct. Only the sun can claim that role. Thank you for the poetic license. 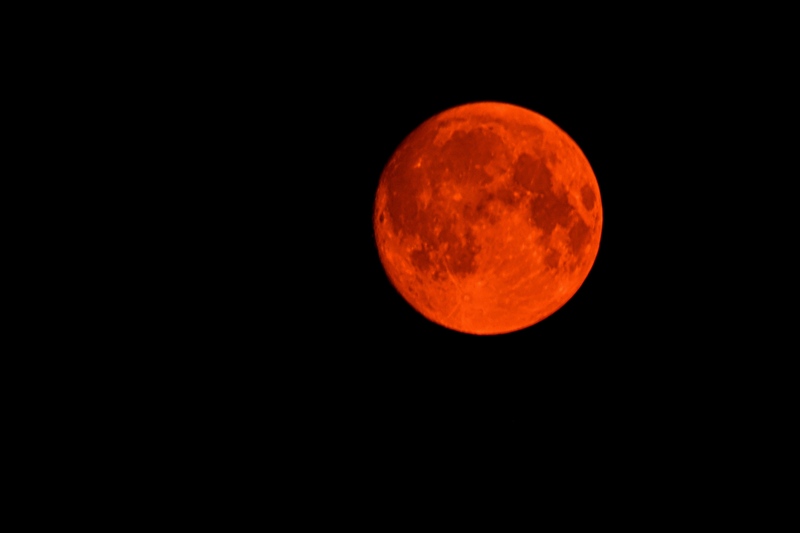 What a moon it was last night… its color in the photo is pretty close to accurate. Very smoky, with fine flakes of ash floating down. I wore a mask, and had to dust off my equipment when I went back inside. My thoughts go out to the firefighters and folks near the wildfire sites. Bless you all. I hope prayers for rain will be answered later in the week. Wildfire crews will be greatly assisted by the last element… Water. Overnight ash fall. 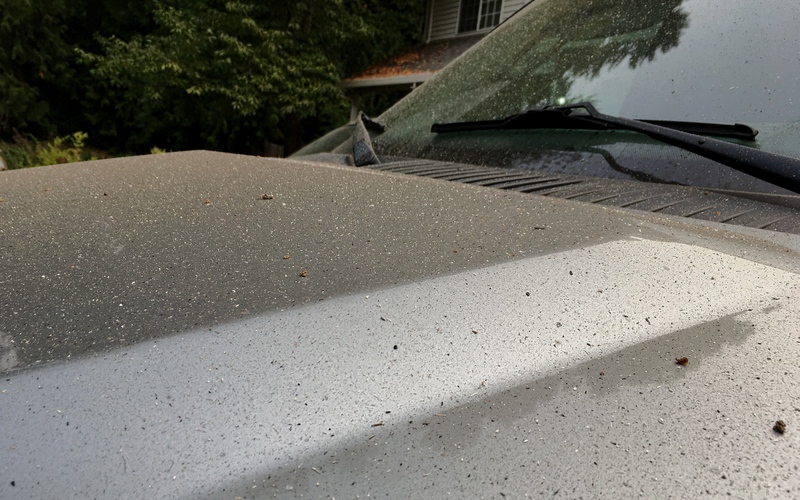 This dusting of various sizes of ash covered everything this morning. Next Post: Waiting | Where’s My Meal? I’m glad you’re an optimist. Maybe I’ll get there eventually. Optimist? Yes, definitely… but sometimes it feels like only by a thread. Certainly tested by the state of our political chaos and responses to current events. I’ve been striving to do that, but it’s kind of like what they say about train wrecks: it’s hard to look away. Gorgeous shot, Jane!! Wildfires are terrible and it always amazes me how far smoke will go. That surrealistic moon is the harbinger of more surrealistic sights to come. Janet, I truly dread to witness the damage these fires will leave behind. Cracking photo Jane, just such a shame the colour is due to the wildfires. Certainly all our thoughts go out to all the firefighters working in Oregon! We Oregonians are probably at the beginning of a time of grief and mourning for the loss of truly magnificent ecosystems. Our state is blessed with some of the most beautiful places I have ever seen. Because what we have is so highly valued… there is no doubt we will work together to replant and restore after the fires are extinguished. Thank you for your concern and thoughts. It’s good to hear that you all care so much for the environment in which you live Jane, I know very little about the state of Oregon, but from the brief bit I’ve seen, it looks like an amazing part of the world!!! You make an excellent point about Nature’s resiliency and the role of fire. There is a lot of debate about whether natural fires should still be permitted as part of the natural life cycle of forests. Problem is, of course, threat to human needs for resources and development. The fire in the Columbia Gorge would be easier to accept had it started from natural causes. Investigation is proving much to the contrary. Authorities are very certain this travesty was caused by a 15 year old boy who was seen throwing fireworks into one of the forest canyons… with our drought conditions, the result is catastrophic. Unfortunately Jane, us humans are generally pretty bad at causing needless devastation, whether it’s kids messing around with fireworks, or careless smokers not stubbing out cigarettes. And on the much larger scale, we aren’t any better as a race of people, however much Trump tries to deny global warming or climate change, there’s absolutely no doubt in my mind, that the planet is suffering from more extremes in weather! The trouble is, when these extremes are averaged out, the weather patterns actually look fairly normal!!! My aplogies for taking so long to get back to you, I’ve started a photography course, and everything has been a wee bit hectic over the last two or three weeks. No apology needed. This was a good conversation. Thank you and best wishes for your class. Great shots, Jane. And I love your take on the challenge. The ash dust that is sprinkled on everything this morning is actually quite distressing. It emphasizes concern for folks more closely involved with these fires. Is smoke/haze apparent in your area? Agreed- both literally and figuratively speaking!